Euphrasia cuneata is a sub-shrub or perennial, which can grow up to 24 in (60 cm) high. The leaves are variable in shape. The flowers are white, with yellow on the lower lip, 0.6–0.8 in (1.5–2 cm) long. 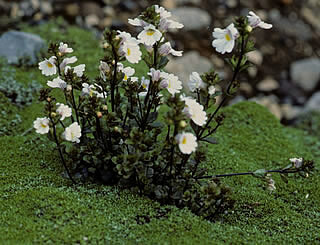 Euphrasia cuneata is found in the coastal to low-alpine areas of the North Island, New Zealand, from Mount Egmont southwards. In the South Island it is found in coastal areas.